The tools allow using the cycle analytics methods in different environments without coding requirements. The newly revised 3rd edition comes with free ready-made downloadable source code and indicators for NinjaTrader, MetaTrader, C++, Excel and cloud-based API integrations. A genetic algorithm is a promising way to detect and follow the status of dominant cycles. It is a new alternative to using digital signal processing for detecting possible cycles. Akin to chromosomes in a genome, genetic algorithms will check possible cycle length settings for long, short, and exit signals. The genome transforms based on an evolutionary process that involves mutation, crossover, and survival of the fittest. Similarly, based on a random population of cycle genomes, the genetic algorithm will evolve to detect useful cycles at different starting points and optimize these cycles based on the rules of natural evolution. Each genome is measured against a special fitness function that simply checks the equity curve that would result if you had traded these volume cycles. The smoothest upward sloping equity curve will have the highest fitness score and the best rating for the cycles in the evolution process. 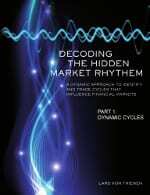 This third book of the series explains how to combine cycle analysis with the use of genetic algorithms to develop entry and exit scripts for real-time trading. Genetic algorithms that provide solutions that are often more efficient, elegant, and complex than those produced by a human engineer. How financial mathematics of cycles are encoded into a GA. A genome that contains a set of chromosomes and genes representing a sine wave cycle. 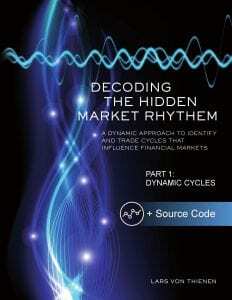 Setting up chromosomes and genes to bring a “cycle population” to trading live. The basics of how chromosomes and genes interact during mutation, crossover and selection of the fittest. Setting up a fitness function that rates the quality of each genome according to the trade performance based on the cycle parameters (sell cycle highs, buy cycle lows). Promising cycle candidates are allowed to reproduce and by repeating this process, strong cycle solutions can be discovered. 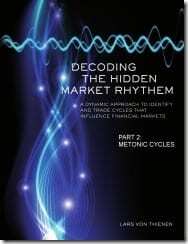 How the fittest candidates, representing the current dominant cycles, evolve and adapt continuously with the market. Setting up a cycle genetic algorithm to produce generic scripts for entry and exit signals.Transforming signals into any script language to build real-time intraday and daily trading strategies.